Motorola's Project Ara dream to create a completely modular phone out of interchangeable modules is speeding towards becoming a reality. The Google-owned phone company has announced it's partnering with 3D Systems, a manufacturer of 3D printers, to help turn its Ara concept into real-life handsets. 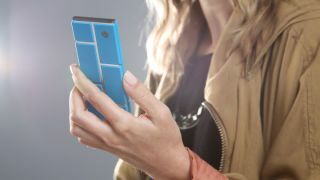 For a quick refresher, Project Ara aims to develop highly customizable, modular smartphones that users can modify to change its look and even upgrade its parts. Instead of buying a whole new phone, upgraders could just attach more RAM or a new camera onto the phone's mainframe, called an endoskeleton. It might sound like a far flung idea but Motorola and 3D Systems teamed up with a multi-year development agreement to create a continuous high-speed 3D printing production platform to build modular smartphones. Beating a similar drum to the customizability of the Moto X, 3D Systems CEO Avi Reichental said in a statement, "Project Ara was conceived to build a platform that empowers consumers all over the world with customization for a product made by and for the individual." If 3D Systems is successful in building a manufacturing platform for Project Ara, it could start producing smartphone enclosures and modules as "Motorola's exclusive fulfillment partner." 3D printing might be the key to Motorola's plan of producing customizable and low-price smartphones like the Moto G.
The system actually working is a major big "if" that's still to be seen. Motorola revealed that there's been a team working on Project Ara for over a year already. The Moto X maker has invited developers to start building their own modules in an effort to come up with an alpha version of the dev kit planned for a launch this winter. The major problem of creating a modular phone is it means each phone component needs its own enclosure and a set of contact pins to connect with the endoskeleton. A modular phone might be upgradable for years to come, but all that added bulk could make even small-screened phone as hefty as the HTC One Max. Check out our review of Motorola's latest smartphone, the Moto G.